I hate cleaning! Let’s just get it out there. I’m all about finding simple solutions to horrible problems. And to me, having a dirty bathroom is a horrible problem. And as much as I hate to admit it, an ongoing problem in my home. 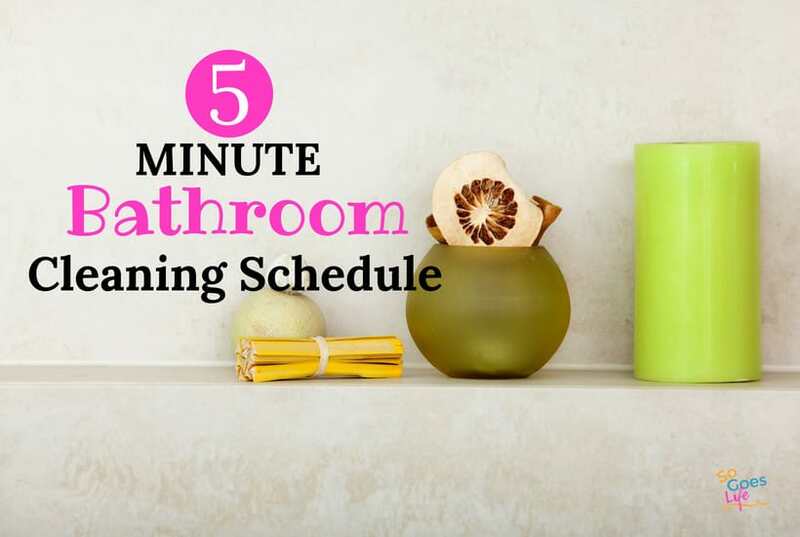 So to help myself, I decided to instigate the 5-minute bathroom cleaning rule. It is a pretty simple rule. I spend five minutes a day on my bathroom cleaning schedule. And when I say 5 minutes, I mean only five minutes. I literally set my timer. Can you imagine always having a clean bathroom? No more rushing to clean when you have last minute company? I know, it sounds crazy, but if you are willing to spend five minutes a day it will work. I’ve discovered that when I have a set amount of time, I don’t dread the process as much. Five minutes is totally and completely manageable to me. Now, I do have to mention that this really only works if you have a clean bathroom to start with. If you are trying to get rid of years of dirt and grime you are going to need a bit more then 5 minutes. On a side note, if you want your bathroom to smell like a spa you have to check out this stuff. The scent is to die for and it actually stays fresh. 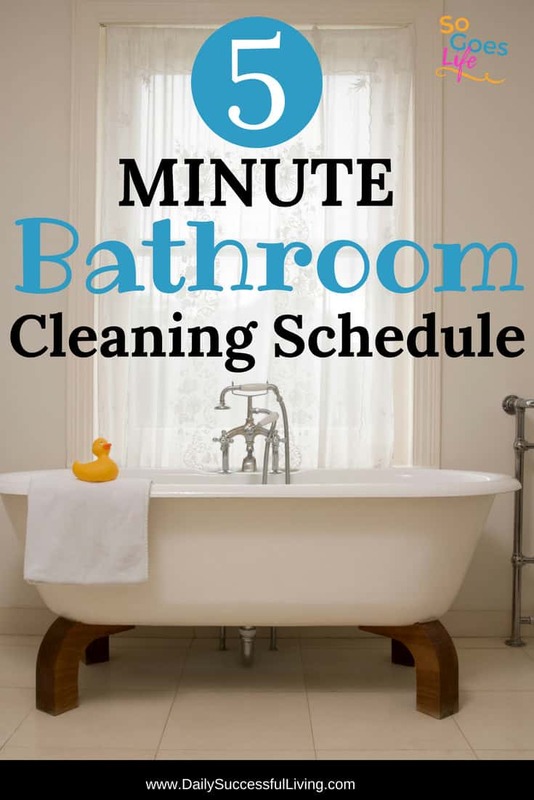 In order for the 5-minute bathroom cleaning schedule to work, you need to start with a mostly clean slate. These are the steps I took to get my bathroom into shape in order for my routine to work. What I mean by this step is that you can’t leave your bathroom in disarray and then expect to quickly clean it. I make an effort to take care of my hair and makeup products as I use them. I don’t leave my clothing or towels on the floor. If you make a regular effort to keep the bathroom clean throughout the day then the rest of the steps are super simple. When my counters are covered in clutter and I’ve got junk throughout the bathroom it becomes virtually impossible to clean quickly. I finally wizened up and did a few things to organize my bathroom that have made a huge difference. Organize your makeup drawer for easy access – I like using makeup drawer organizers to keep everything easily accessible. I also took the time to drastically reduce my makeup collection. I now have some cover-up, an eyeshadow palette, mascara and two brushes. Getting rid of all the extra’s I rarely use has been amazing. PS. I did put the fun funky make-up in my Halloween box. You never know when you’ll want some bright red lipstick or purple eyeshadow. Get an organizer for curling irons, flat irons, blow dryers and all the random hairbrushes. I use this type of organizer and put it in my closet. It works great for me, but you may want something more like this if your closet isn’t next to your bathroom. Side note – You have to try this hairbrush – it is super inexpensive, and works with both wet and dry hair and crazy thick hair like mine. There is nothing worse than wasting time hunting down cleaning supplies. I use a caddy like this one to keep my supplies organized and easily accessible. Shower Cleaner – I have been using this daily shower cleaner and am in love! On a total side note, since having my daughter I’m a lot more concerned about harsh chemicals and cleaning products, I’ve been gradually switching all of my cleaning supplies to more natural products. I was never the type to care, but after using more and more natural products I’m completely sold. If you are trying to gradually switch over your products like I’m doing I highly recommend checking out The Grove Collective. They have amazing deals and so far I’m seriously in love with all of their products. I like letting my cleaners sit for a few minutes before scrubbing the toilet. 2. Quickly put away any miscellaneous items you may have left out. Ideally, you’ll have already done this step, but let’s be honest, there is always something on the counter. I grab a cleaning cloth and quickly wipe down any exposed surfaces. The goal is to quickly clean the counters and toilet seat. I like to spray my shower with white vinegar during this step. At this point I’m getting the soap scum and residue up so it won’t stain. This is where I’ll quickly straight up my shampoo bottles and personal bath toiletries. I’ll quickly fold the towels or toss them into the laundry. I’ll make sure my toothbrush and toothpaste are cleaned up. Your goal here is to add the little pretty touches that make the bathroom look good. I quickly clean my mirrors and then use the wet towels to wipe down my faucets and other metals trim. I’ve found that glass cleaner works great to get rid of water spots on metal trim. I use a toilet brush to quickly clean the toilet bowl. If you struggle with browning or hard water stains you may want to consider using the automatic toilet bowl tablets. Phoenix water is really hard, so I always used them until recently when we finally got a soft water filter for our house – best decision ever. I just take a quick look at the bathroom and make sure you’ve gotten everything clean. Once a week I have to spend an extra couple of minutes to clean the floors, but even that can be done super quickly if you have all your supplies ready to go. I also occasionally spend some extra time on my shower and tub. However, I’ve found that by spraying vinegar regularly, it stays pretty clean. I know it sounds crazy, but if you can stick to this cleaning routine, you’ll finally have the clean bathroom you’ve always dreamed about. Or at least you’ll have a clean bathroom that doesn’t leave you scrambling when company comes. Here is the thing though, you have to do this EVERY SINGLE day. If you skip a few days you’ll fall back into your old habits and before long you’ll have a disaster bathroom again. I recommend adding bathroom cleaning to your habit tracking list – there is nothing like being able to cross off a box to keep you incentivized. Don’t laugh, but my secret tool for cleaning my tub is to use a broom. I got a cheap broom at the dollar store. I spray a bit of cleaner and then scrub everything down with a broom. I know it sounds crazy, but it works and more importantly, it saves your back and knees. Always a win in my book!